PHASE‐CHANGE SWITCH exploits the abrupt Metal‐Insulator‐Transition (MIT) that happens in certain materials (as for Vanadium dioxide, VO2) at temperatures that make them interesting for electronic circuits and systems by their performance, energy efficiency and scalability. The project combines energy efficiency and extended functionality with the engineering of new classes of solid‐state Beyond CMOS switches. 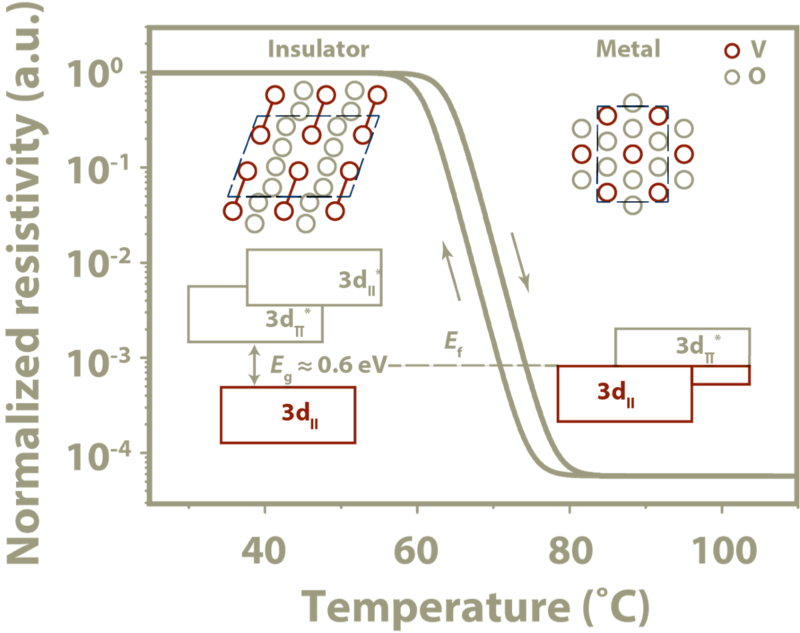 Metal-insulator-transitions (MITs) are extremely fast and phase change devices deliver deep subthermal switching (<10 mV/decade at room temperature). 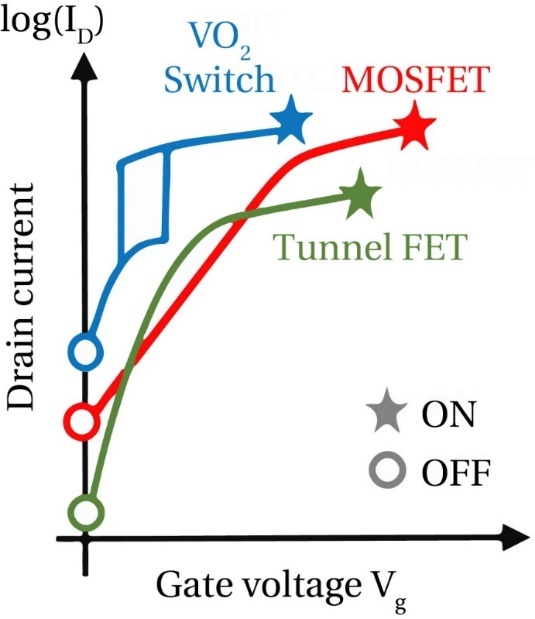 Very promising energy efficient devices are expected with a voltage supply of integrated circuits (ICs) below 0.5 V, ON currents better than silicon MOSFET and standby power potentially comparable with tunnel FETs. PHASE‐CHANGE SWITCH covers the entire value chain, from novel phase‐change materials (alloying and straining techniques are used for the engineering of the transition temperature in the material), to new device and circuit architectures together with their scaling and integration on silicon CMOS compatible and GaN platforms. Smart designs and exploitation of unique properties of the phase change VO2 beyond CMOS switches are targeted within the same technology platform including: (i) von‐ Neumann steep‐slope logic devices and circuits, to extend CMOS with novel functionality and energy efficiency, (ii) uniquely reconfigurable energy efficient radio‐frequency (RF) circuit functions from 1 to 100 GHz, (iii) unconventional scalable neuristors exploiting the hysteretic RC switching behaviour for neuromorphic computation, and, (iv) disruptive classes of solid‐state devices for neuromorphic computation, exploiting non‐volatile memory effects. PHASE‐CHANGE SWITCH expects to create new applications and markets and reinforce the leadership of European industrial players in the field of energy efficient Internet‐of‐Things and high frequency communications.